Picnic – June 18th – HOT! The 2010 Blue Community Makeover Program (Go Blue!) 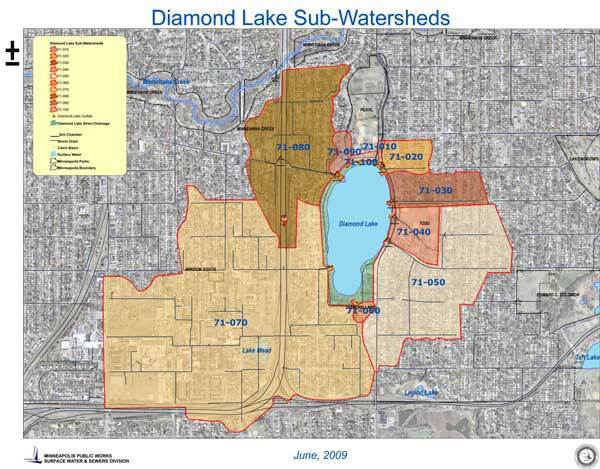 is a pilot program through which property owners in the Diamond Lake watershed are implementing stormwater mitigation projects that will have a direct and positive impact on the water quality of Diamond Lake. Stormwater drains to Diamond Lake from the approximately 690-acre watershed, which includes portions of the Windom, Lyndale, Tangletown, Diamond Lake, and Hale neighborhoods in Minneapolis (see map, above). In fall 2009, all watershed property owners were invited to attend one of two community interest meetings about the project. At that time, residents registered to participate by expressing interest in projects ranging from simple rain barrels and trees to rain gardens—from permeable paver patios and driveways to rainwater capture and reuse systems—that directly affect storm water runoff and lake water quality. The program will help these property owners make changes for improving water quality and at the same time realize cost savings through economies of scale and cost sharing with matching grant funds. Application for Clean Water Grant matching funds was made December 1. The State of Minnesota Board of Water and Soil Resources (BWSR) delivered the exciting news of successful funding in February. The schedule leading up to the June buildout is tight and plans are progressing rapidly. The buildout offers volunteer opportunities for individuals or groups to get involved—digging, planting, or documenting. There’s something for everyone. Go Blue! is sponsored by Friends of Diamond Lake, the HPDL Community Association, and Hedberg Landscape and Masonry Supply. The Minnehaha Creek Watershed District is the grant administrator for the State of Minnesota Clean Water Grant funds. Diamond Lake water quality has suffered in recent decades due to pollutants and heavy sedimentation from storm water runoff. The water quality been graded ‘F’ through research conducted by the Minnehaha Creek Watershed District. Water that rolls off roofs, yards, and streets in the Diamond Lake watershed ends up in Diamond Lake—bringing pollutants and silt with it. 1. Friends of Diamond Lake developed a Lake Management Plan for Diamond Lake, which was approved by the Minneapolis Park and Recreation Board in late October. Based on community input, a key objective of the plan is to champion projects that home and business owners can do help to improve Diamond Lake water quality. 2. Hedberg Landscape and Masonry Supplies emerged as a partner with the expertise and resources to make implementation of the water quality improvement projects on a larger community scale possible. 3. $2.5 million in matching funds for clean water projects became available through Clean Water Grants from the Board of Water and Soil Resources (BWSR) for projects that get communities involved in water quality improvement, so we applied for a grant in partnership with the Minnehaha Creek Watershed District December 1. Copyright © Friends of Diamond Lake 2010 - 2013. All rights reserved. PLEASE NOTE: The GoBlue! project was completed in 2011. Please visit friendsofdiamondlake.org for current information.